This year, 27,499 students applied to the College’s Class of 2018, a 9.5 percent decrease from last year’s record high of 30,396 applicants. University spokesperson Jeremy Manier attributed the decrease to problems with the Common Application but noted that the number of applicants has steadily risen since 2006, when the College received 9,538 applications. “Applications to the College remain at historically high levels, more than triple the numbers prior to 2006. Problems with the Common Application affected this year’s total, but highly qualified students who are passionate about the College continue to apply in extremely high numbers,” he said in an e-mail. This year’s revamped Common Application was wrought with technical glitches that caused College Admissions to push back the regular admissions deadline to mid-January, instead of the usual January 3 deadline. The decrease in applicants this year marks a departure from steady increases over the last 10 years. Last year’s 30,396 applicants comprised the College’s highest total yet and a 20 percent increase over the previous 25,271 applicants. Application numbers have markedly increased since the College adopted the Common Application in 2009 and hired Dean of Admissions Jim Nondorf in 2010. The University of Pennsylvania saw a sharp increase in applications for the class of 2018: Its 35,788 applications marked a 14 percent jump from last year. Northwestern received 33,200 applications, a 1.3 percent increase from last year. Princeton received 26,607 applications this year, a 0.7 percent increase. Harvard and Columbia both saw slight decreases: Harvard received 34,295 applications, a two percent decrease from last year, and Columbia received 32,952 applications, a 1.5 percent decrease. In recent years, the University has touted developments such as the Logan Center for the Arts, the Institute of Politics, the Institute of Molecular Engineering, and UChicago Promise as attractive to prospective students. This year’s applicants cited various reasons for applying. Josh Nickelman, a high school senior from Kettering, Ohio, who was admitted during the Early Action round of admissions, visited campus in November as a prospective track athlete. “[The track team is] a really close team and really tight-knit. That’s what I felt when I visited, and I really like that because as soon as you get there, you have a team, people you know can help you with whatever you need,” he said. Noel Rubio, from Guam, who was also admitted, cited a variety of reasons for his interest in the College, one of which was the History and Philosophy of Science (HIPS) major. “When I found out about the HIPS program, I was really excited because I’ve always wanted to go into a premed degree that blended some sort of humanities with the sciences,” he said. While Nickelman plans to attend UChicago, Rubio will make a final decision after the regular admissions round. 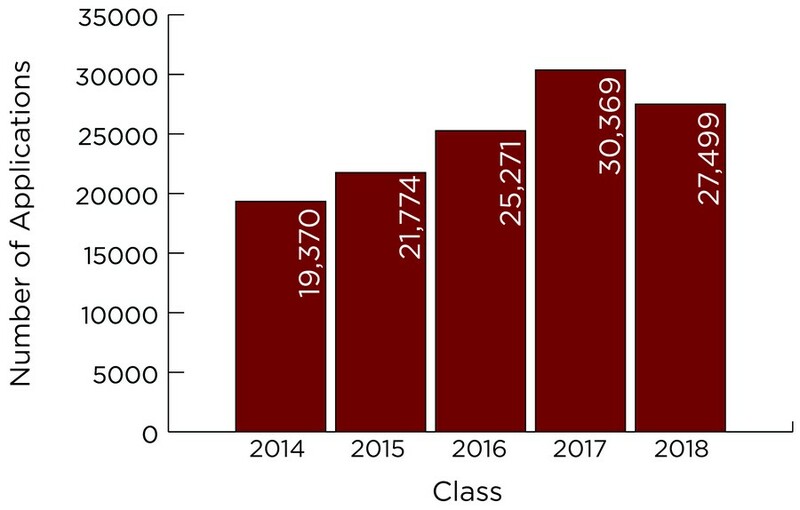 UChicago received 11,143 Early Action applications this year, an all-time high. Those applicants received admissions decisions in December. All Class of 2018 applicants will receive admissions decisions by late March.